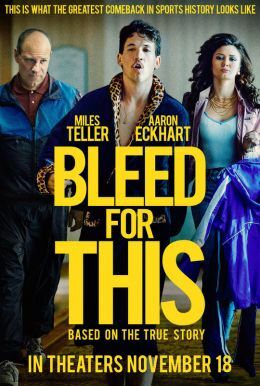 Bleed For This presents the story of boxer Vinny Pazienza (now known as Vinny Paz), whose career included World Champion titles in multiple weight classes (lightweight, light middleweight, and super middleweight). The focus in this Ben Younger-directed film is the 1991 near-fatal automobile accident that left Paz’s future uncertain and the unbelievable comeback that followed. It’s a powerful inspirational account—a demonstration of audacious strength of body and mind so outrageous you’ll swear it can’t be true (as per usual, some details have been fudged but nothing that damages credibility). Actually, as far as Paz’s doctors were concerned his post-accident future was all but written in stone. His neck was broken. His spinal column was a fraction of an inch from being severed. The medical experts advocated for spinal fusion surgery, which would ensure a chance for Paz to walk again. But no more boxing. Paz defied his doctors’ orders and elected for “halo surgery” which required him to have a metal “halo” apparatus literally drilled into his skull. For months he lived in this cage-like contraption with the day-to-day, hour-to-hour, minute-to-minute risk that even a small bump or jolt to the halo could result in the severing of his spine. Younger and his production team (which includes Martin Scorsese) chose the right actor to play Vinny Pazienza. 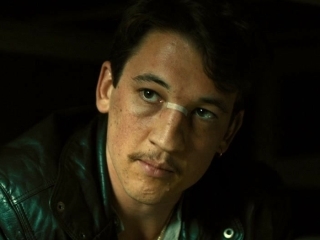 Miles Teller, one of the best young actors in the business right now, commits fully to the strutting, determined, and ultimately triumphant Paz. Younger’s approach is to the material is perhaps a bit rote, if we’re being honest. If you’ve seen a lot of boxing films, you might have the sneaking suspicion that you could’ve plotted out the screenplay’s beats. Don’t let that put you off. This comeback story, as Paz finds the willpower to begin training in secret while still encased in the halo, doesn’t actually require anything fancy in terms of presentation. 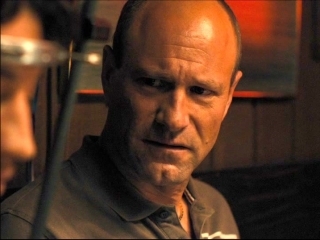 Not only is Teller entirely convincing, Aaron Eckhart is also moving as Paz’s unfailing trainer Kevin Rooney. Although Rooney’s struggles with alcohol are dealt with so offhandedly as to feel almost extraneous, Eckhart and Teller convey the emotional bond between Paz and Rooney. And speaking of bonds, Paz’s tight family ties are depicted with vivid realism as well. Ciarán Hinds delivers an award-worthy turn as Paz’s father Angelo, who begins as his son’s biggest cheerleader. He eventually finds himself in staunch opposition of Paz’s comeback attempt. To Hinds’ credit, Angelo’s emotional support and belief in Paz is always deeply felt. Spoiler Alert: For some reason, the Younger chose to depict Paz’s post-accident comeback fight as being against Roberto Duran. While Paz beat Duran twice, once in ’94 and again in ’95, his 1991 return to the ring was versus Luis Santana. I guess maybe Younger thought Duran’s higher profile would somehow heighten the tension, but since Duran isn’t a presence in the film prior to the concluding fight it doesn’t really matter. Maybe the filmmakers were aware of the Duran biopic Hands of Stone that was due out just weeks before Bleed For This and thought they’d piggyback on any popularity that film enjoyed (which it didn’t—Hands of Stone bombed). Bottom line: Younger should’ve stuck to the facts in this case, for the sake of authenticity.